For nine Hilton College students, this summer was all about research, internships and special projects, thanks to a USDA-NIFA grant and a University of Houston undergraduate fellowship program. The Food Safety and Nutrition Ambassadors Program – made possible by a grant secured by Associate Professor Juan Madera from the USDA National Institute of Food and Agriculture – provides students with summer projects or internships in the areas of food safety, hospitality management or nutrition. Dr. Madera worked with undergraduates Brianna Deatherage, Nuray Taylor and Adria Watson, as well as doctoral candidate Lindsey Lee. 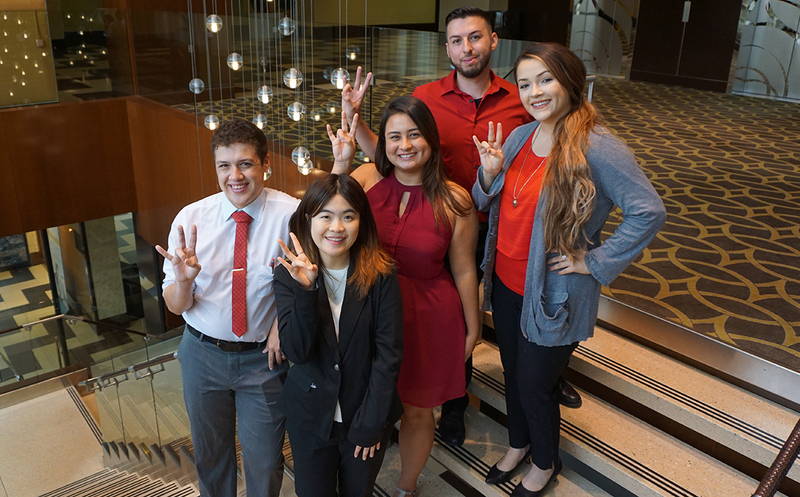 (Pictured from left) Jack Hodges, graduate student Maggie Cai, undergraduates Alberto Beiza and Isabelle Nakamura, and doctoral candidate Karla Acosta were mentored by Assistant Professor Sujata Sirsat. The grant also awarded each student a $2,500 scholarship for the 2018 fall semester. On average, Dr. Madera said the students worked on a 100-hour summer internship project in their fields of interest. For example, Deatherage developed a business plan for a “Hilton Bakery.” Her plan detailed kitchen measurements and layouts, costs, menus with nutritional values and dietary restrictions, budgeting, and daily/weekly profit estimates. She also created a website for her proposed bakery. Others explored projects in the areas of differences in workforce indicators between companies from the foodservice and lodging industry versus retail, banking and medical industries. Additionally, the students will complete the Rise Diversity Leadership Program later this fall, presented by LeadUH and the Center for Diversity and Inclusion. Junior Jack Hodges was also selected to participate in the Summer Undergraduate Research Fellowship at the University of Houston (SURF-UH), an annual program supported by the Office of the Provost, the Division of Research and the Honors College. Held each summer, SURF-UH provides an opportunity for sophomores, juniors and seniors to participate in a 10-week research experience under the direction of faculty mentors. Hodges worked with Dr. Sirsat and Assistant Professor Minwoo Lee on an exploratory project that integrated big data and business analysis to identify trends in the outbreaks of foodborne illnesses. Learn more about Hodges' research by attending his poster presentation during the 14th Annual Undergraduate Research Day from 4-6 p.m. on Oct. 18 at the M.D. Anderson Library.